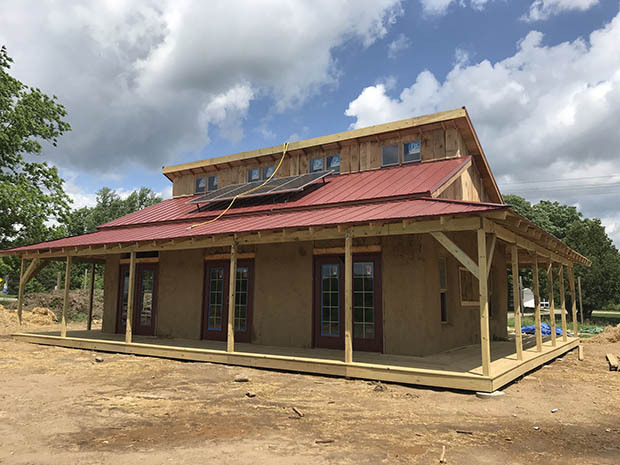 A house of straw is rising on the grounds of University of Michigan’s campus farm this summer, constructed by students enrolled in a green building class. The sustainable structure features 18-inch-thick straw bales covered in adobe and is topped with a metal roof sporting solar panels. It will be the first building on the Ann Arbor campus to be off the electrical grid—and the first university structure built by students, reports Michigan News. Once the straw house is completed, Michigan Dining plans to host farm-to-table dinners there. It will also serve as headquarters for the university’s annual fall festival, headed up by UM’s Sustainable Food Program. The building sits amid vegetable fields and hoop houses tended by student farmers, a site that reinforces the sustainability message. The straw house takes the school’s sustainability initiatives to the next level; however, the University of Michigan has been a leader among colleges and universities when it comes to integrating sustainability into foodservice and the curriculum. Keith Soster, who holds the post of director of sustainability and student engagement with Michigan Dining, partners with students, college organizations and the community to promote sustainable food systems. And Alex Bryan, manager of the Sustainable Food Program, works with Michigan Dining to use 100% of the food grown on the campus farm in the school’s dining halls and cafes. Read the full story via Michigan News.